Claire Marie Weston, 90, of Girard, Kansas, formerly of Walnut, Kansas, died at 6:24 a.m., Tuesday, September 11, 2018 in the Girard Medical Center. Claire was born December 4, 1927 at Walnut, Kansas, a daughter of Charles and Bertha (Shively) Kennedy. She grew up in the Walnut area and graduated from Walnut High School. She worked at Police Brothers Grocery Store in Walnut. 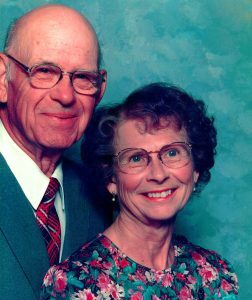 Claire married Thomas H. Weston on June 1, 1949 in St. Francis Catholic Church in St. Paul, Kansas which was built by Claire’s ancestors. Tom survives of the home. She worked in the Bourbon County Assessor’s office in Fort Scott for over 18 years. She and Thomas retired to Girard in 2003. Claire was an avid square dancer and she enjoyed dancing with her favorite partner, Tom, for over 20 years. She also enjoyed sewing and gardening and was well known for her and Tom’s Christmas decorations. Families would drive for miles to enjoy the outdoor sights and stop in for a craft, which Claire had handmade. Claire was a member of St. Michael Catholic Church in Girard. Survivors, in addition to her husband, Thomas, of the home are her daughters, Sharon Weston Burns, and her husband, Jack, of Shawnee, Oklahoma, Joyce Weston of Girard, and Donna Weston McDaniels, and her husband, Larry, of Mooresville, North Carolina; a son, Wayne Weston, and his wife, Luzia, of Canyon City, Texas; seven grandchildren; two step-grandchildren; two great-grandsons; a sister, Louise Jarboe of Arma, Kansas; her brothers, Melvin Kennedy of Kansas City, Missouri, Harold Kennedy of Kansas City, Kansas, and Leonard Kennedy of St. Paul. Claire was preceded in death by a brother, Charles Kennedy, and a step-grandson. Funeral Mass will be at 10:00 a.m., Friday at St. Michael Catholic Church in Girard with Fr. Floyd McKinney as Celebrant. Burial will be in St. Patrick Cemetery in Walnut. The Rosary will be at 7:00 p.m., Thursday at the Smith-Carson-Wall Funeral Home in Girard where the family will receive friends until8:00 p.m. Friends may call after 2:00 p.m., Thursday at the funeral home. Memorials are suggested to the Walnut Community Services or the American Diabetes Association and these may be left at the church or the Smith-Carson-Wall Funeral Home, 518 W St. John, Box 258, Girard, 66743.